We are a full Google Partner which means that we fulfil Google’s own criterd standards – following their best practices – to ensure that our clients get the best results from Google’s advertising product suite. Our partner status benefits our clients as we get access to information, training, beta testing of new systems and offers that mean that we can deliver more for our clients. As part of our Google Partner status we have to hold up to date qualifications in the use of Google products, from search and display advertising to Google Analytics. These qualifications have to be retaken on a regular basis to ensure that we are always keeping up to date with the latest advances in online advertising. This adds to the reasons why you should use a full Google Partner for your online advertising. With our extensive experience in helping businesses with longer and more complex purchase cycles to be profitable with their digital marketing it is no surprise that we are a HubSpot Partner Agency. The premium inbound marketing software solution, HubSpot provides a multi-layered technology stack that allows us and our clients a more powerful platform with which we can create, manage, optimise and report on inbound marketing campaigns. We help businesses both nationally and internationally develop more profitable inbound digital marketing with the HubSpot CRM, Marketing and Sales software. With HubSpot’s emphasis on excellence in delivery and extensive training resources the culture as well as the product fit between HubSpot and Innovation Visual is clear. In addition to being a Google Partner, Bing Partner and HubSpot Partner, Innovation Visual have become a Trustpilot partner. One of the benefits of Trustpilot is giving customers the platform to leave reviews about your company. There is evidence to suggest that Trustpilot reviews are a ranking factor in Google search results making Trustpilot a powerful tool for your business which can have a positive impact when used in the right way. Customers opinions are important for influencing new customers buying decisions and Trustpilot is a great way of presenting positive reviews in Google search and on your business’ website. If you would like to find out more about Trustpilot then speak to a member of the Innovation Visual team who will be able to offer advice on how TrustPilot can benefit your business. 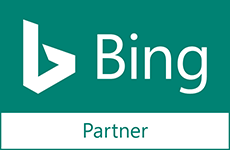 In addition to our Google qualifications and status we are also Bing Accredited professionals and hold a number of further Microsoft online advertising and qualifications. This is because Google is not the only search engine and it is often beneficial to advertise on Bing, and use Microsoft tools to further enhance the ROI of your online marketing efforts. We are also members of Bing’s search marketing agency program, which in the same way as Google Partners, gives us special access to offers, tools and training. These things are all designed to help you get more out of your budget so that you continue to invest using these platforms. We are very proud of the achievements and accreditations that we hold because we understand that they demonstrate to potential clients that we have extensive knowledge in this field; and for our clients our participation in the major online advertising partner programs gives them real financial and operational benefits. In 2017 Innovation Visual was chosen to be one of just 30 agencies chosen by Google to participate in their prestigious Elevator programme. To be offered a place on the Elevator Programme, led by Robert Craven, an agency must meet a range of criteria, including showing evidence that the agency is providing a high standard of results for their clients and has high potential for growth. The intensive programme over a 6 month period run by Google equips the leaders of agencies to help businesses succeed online and deliver even more for their clients. As well as our industry accreditation and qualification Tim is also a member of the Institute of Direct and Digital Marketing. This leading specialist marketing institute is open only to professionals who can demonstrate both skill and experience in the field of direct and digital marketing. Professional membership of the Institute of Direct and Digital Marketing is one of the few recognised professional memberships by the Government’s Growth Voucher Scheme that allows us to provide specific digital business growth consultancy under this scheme. Please contact us if you have qualified for growth vouchers to ensure that they are in the applicable advice area for you to be able to recoup consultancy costs.